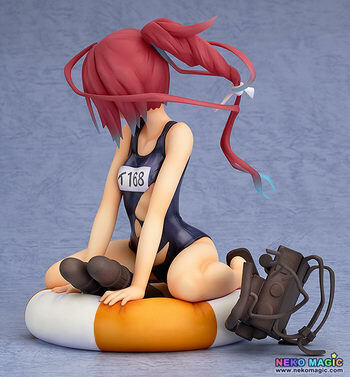 September 24th, 2014 By: GGT Category: 2015/03 release, Figure News. Max Factory is going to release the I-168 ( 伊168) Half-Damage Ver. ( 中破Ver.) 1/8 PVC figure from the popular web game “Kantai Collection” ( 艦隊これくしょん ) developed by Kadokawa Games. Will be released in March 2015. Around 145mm tall, 10,926 yen. From the popular browser game ‘Kantai Collection -KanColle-‘ comes a 1/8th scale figure of the submarine I-168! She has been sculpted in her damaged version that is reached after falling below half health. 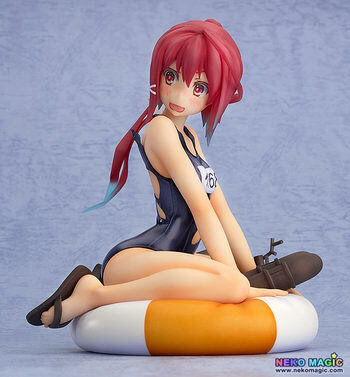 The contrast of her pale skin and the torn swimsuit, together with the flustered expression on the normally confident I-168 have all been faithfully reproduced on the figure. The original illustration only ever showed her from the back, but the figure allows you to enjoy her cuteness from any angle you please! Grab the faltering sniper of the seas for your collection!